A song to play while reading about the Yankees: “Never Going Back Again,” by Fleetwood Mac. After years of big spending on aging veterans under George Steinbrenner, Yankees GM Brian Cashman has taken the reins in full the last few years, infusing the team with youth and a wealth of analytical resources. With the richest team in baseball now acting like one of the smartest spenders, there is no reason for the Yankees to ever go back to the mediocre drudges of the early 2010s. Despite an active offseason that saw the Yankees add to an already historic bullpen, bolster their rotation with James Paxton, and deepen the infield rotation with the signings of Troy Tulowitski and DJ LeMathieu, the Yankees’ free agent activity felt lacking in star power. The two biggest free agents of the last half decade, Manny Machado and Bryce Harper, signed without much of a nibble from the Yankees, causing some to question whether the team was prioritizing profits over fielding the best team possible (spoiler alert: they are). Harper had been linked to the Yankees for years. As a superstar player with a flair for the dramatic who grew up a Yankee fan, the connection was obvious. However, the emergence of Aaron Judge coupled with the acquisition of Giancarlo Stanton made it clear that there wouldn’t be an easy way to fit Harper in the Yankee outfield. While they certainly could have managed to get Harper into their lineup, it is easy to see how a $330 million investment for a luxury may not have made sense for the team. Machado, on the other hand, seemed like a perfect fit for the Yankees. The 26-year-old shortstop-slash-third baseman was coming off a strong season in which he put up 6.2 WAR, good for 8th in all of baseball. Further, with shortstop Didi Gregorious out for at least half of 2019 after undergoing Tommy John surgery, and questions surrounding Miguel Andujar’s ability to stick at third base, it was easy to imagine Machado’s fit on the roster. In the face of all of this, though, GM Brian Cashman and the Yankees front office seemed on the periphery of the market from the beginning, eventually losing out to the ostensibly small market Padres. While anger over the Yankees’ absence from the Harper and Machado markets may seem like the greed of spoiled fans, there are some legitimate reasons to question the front office and ownership. The Yankees have essentially bowed out of free agent market over the last few seasons angling to get under the luxury tax threshold, selling fans on their ability to spend big on transcendent free agent players in the mold of Harper and Machado in the future. Instead, the team’s payroll is currently lower than it was in 2017, despite record-breaking 2019 revenues for Major League Baseball. Frustrating as these payroll issues are, Cashman has done an excellent job with the resources he’s been given, acquiring a potential ace in James Paxton, bringing back Zach Britton along with Adam Ottativo for the bullpen, finding a nice value deal in LeMahieu, as well as extending Severino and Hicks. These additions to an already immensely talented core mean that the Yankees should be just fine, even if they missed their opportunity to add a young, generational talent. What is the Yankees’ most recent accomplishment? Beginning to lock up the young core. This offseason has seen contract extensions signed by young stars including Blake Snell, Eloy Jimenez, and Aaron Nola, as players look for security ahead of potentially contentious CBA negotiations in 2021. This Yankees have been one of many teams to take advantage of this concerning trend, signing Aaron Hicks and Luis Severino to lengthy extensions. Look for the team to continue working on deals for the rest of its young core, including Aaron Judge, Gleyber Torres, and Gary Sanchez. 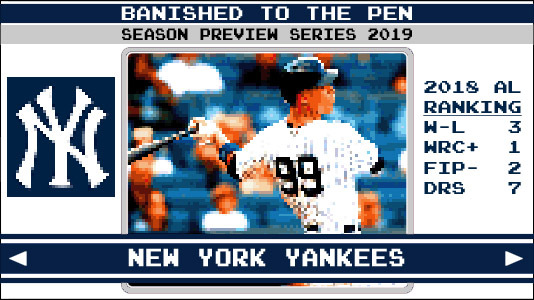 How do the Yankees define success in 2019? World Series Champs. Projected by FanGraphs to be the second best team in all of baseball, anything other than a deep playoff run would be a major disappointment. Featured on the recently revived (Fantasy) Fringe Five, Tauchman was one of the best performers in the minors over the last two years with a 149 wRC+. He’ll be hard pressed to find playing time in New York’s crowded outfield, and at 27 may prove to be a AAAA player, but his mix of power (.236 ISO) and contact ability (15% K-rate) over the last two years make him one of the more intriguing and unpredictable players on the Yankees’ roster. Mariano Rivera Hall of Fame Celebration, August 17. Rivera is the greatest closer of all time, and this offseason he became the first ever player to be unanimously inducted into the Hall of Fame. He’s a Yankee legend and this celebration is sure to bring out key members from the late ’90s and early ’00s powerhouse Yankee teams.